I wants to know the MASTER PLAN of sector 75 A plan around the HALDIRAM. I want to know the master plan for Baghanki village land, tehsil Manesar(Gurgaon). I want to buy a property in sector 69 but some ppl saying that area beyong southern peripheral road is not in master plan so it will take time to develop. Kindly tell me what’s the truth. Kya village sultan pur ka master plan bna h ? Koi bta shkta h Ki sec 98 me koi arzone and commercial projects ane wale h kya ?? I have ten acre land from eight kilometres from nh-8 k her ki toll plaza. Just near to golden green golf and resort India pvt ltd. What are the possibly ist of this area in future. Taoru was included in Gurgaon in june-aug 2014. do we have an updated Master plan with that inclusion. Kindly suggest me whether this otpion is worthwile for me? and this purchase of plot is for residence purpose , kindly suggest. Is the master plan 2031- notified and would be followed in future? This is the master plan map for 2013 but there are still several amendments going on in the master plans of every state according to the new developments, population and urbanization. However the major layout remains the same. I want to purchase a plot in Bhondsi , Shyam Kunj , Sohna Road , Gurgoan. Badhshahpur will be the best location for both residential and investment purpose. why is this map black and white even after download ?????? 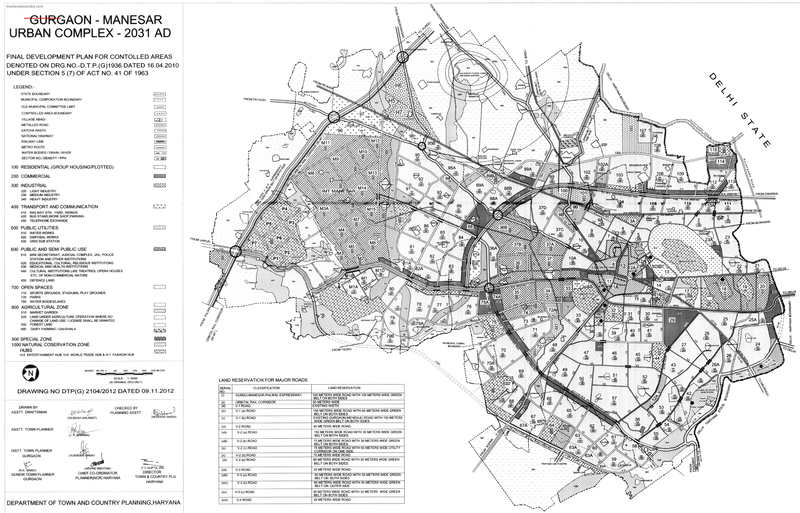 The color map has not been made available by the Town and Country Planning Department of Haryana. This is all what is available right now, we will update once the colored master plan is out.